Saturday was a PV day. Ahhhhh, feeling MUCH better tummy wise! I am still retaining some water, but hope to be back to normal for my trip to Thailand this week. After work today I was invited to Chiara and Joe’s pre-wedding dinner in Joe’s family’s village. As I was walking down the alley between houses on the way from Joe’s family house to the warehouse where the dinner took place, I realized how amazingly fortunate I really am! I am blessed and I don’t take that granted for one single minute! Good food, good company, many different languages and so much fun! Today they will have their celebration of marriage… Good times. I had planned on a pot of yogurt when I got home. But no appetite for it. 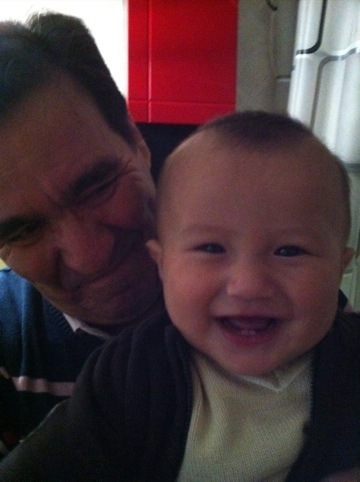 Alessandro and his Papa from Milan. 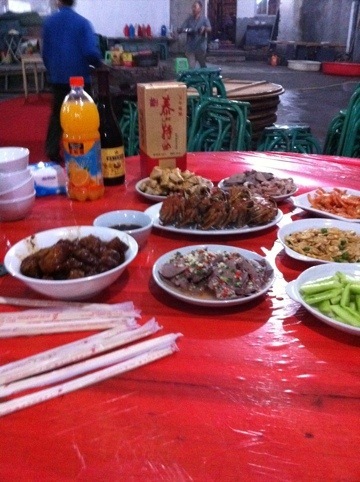 This entry was posted in Weight Loss and tagged Dukan diet by flamidwyfe. Bookmark the permalink. Oh great pictures. So glad you are happy. Diet is heading in the right direction. There are natural ups and downs. Have you been eating out more? Sodium is so hard to control no matter where you live. Glad your tummy is better. Yay — glad to hear that you’re feeling better! Pleased to learn you are feeling better. Looks like you had a grand time at pre wedding. It seems that every where in the world you go you blend in and meet the most interesting people. And I get to tag along. Isn’t the internet great. Have fun in Thailand .